I first encountered Geoffrey Bibby’s Four Thousand Years Ago in a “Best-of” volume of the Robert E. Howard fanzine Amra where the reviewer enthused that the second millennium BCE was a time when Conan could have lived again. For a younger self that was recommendation enough, and I tracked down a copy in the library. On a whim I decided to order a copy and have a look with more scholarly eyes. The volume which arrived in the mail has an old bookseller’s stamp from The Public Bookshop, PO Box 1, Bahrain which is very appropriate, for Bibby excavated there and believed it was the Dilmun of the Sumerians, the place through which all good things came. Like the statuette of Lakshmi from Pompeii, who can say how it made its long way to its current home? This sort of gentle warning that archaeology can show us that two villages had similar pottery and burial customs, but not whether the inhabitants saw each other as part of a common ethnicity, may have been more effective than a dozen expressions of learned outrage at the methods of popular writers and TV producers. So instead of complaining, I marvel at this book which refuses to fit itself into the conventions of a single genre. I would not recommend that anyone read this as their first introduction to the Bronze Age. Details do matter, and quite a lot of the details about the Bronze Age which we thought we knew in 1962 have turned out to be incorrect. On the other hand, if they want to learn about the world before electrification, this will certainly do better than most fantasy novels. 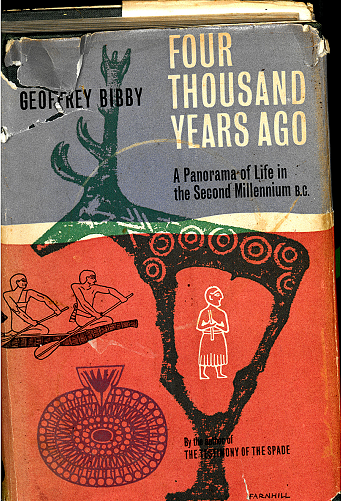 And Bibby’s book does project that the second millennium BCE was populated by real people with real loves and hates and fears who did just as much living as any other population the same size. That we can only imagine the details tells us not that the Bronze Age was a dull and shadowy time but that Chronos incessantly gnaws on the record of the past. Further Reading: Bookfinder is a good resource for locating obscure used books like this.